Siachen Glacier region in the Eastern Karakoram Range of Himalayan Mountains has been the site of intermittent conflict between India and Pakistan for several decades. The area has come to be known as the world’s highest battlefield. Although Siachen means land of wild roses but in reality this place is barren and icy cold. It has minus 14 to minus 34 degrees temperature in summer and minus fifty degrees in winter and at these temperatures almost everything with life, and the things that sustain life simply collapse. India controls two thirds of the glaciated area and the balance has been encroached by Pakistan. On 03 February 2016, ten brave soldiers of 19 MADRAS Regiment were trapped under a mass of snow after an avalanche hit the Sonam Post, situated at 19,000 feet on the Siachen Glacier. 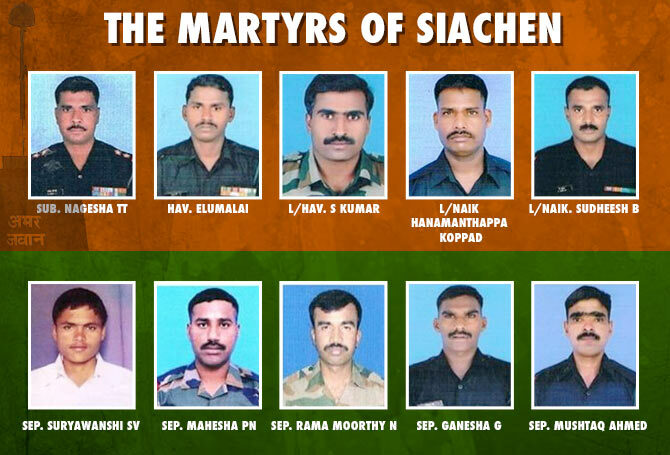 Nine brave soldiers made the supreme sacrifice in defence of their motherland that day. Under almost 30 feet of ice, all that Lance Naik Hanumanthappa had going for him was a small air pocket and a lot of grit. Outside, a group of well-trained Army men, two dogs, a small team of medical professionals and military pilots carried out a relentless, almost death-defying rescue act under the most inhospitable conditions the world can ever imagine. The rescue of Lance Naik Hanumanthappa personified the triumph of the indomitable spirit of human resilience against all odds, including the might of Mother Nature, and the determination of man to never give up on his fellow men. The nation paid homage to these brave-hearts and military funerals with all respects was conducted at the hometowns of these martyrs. Military funerals are solemn affairs and everyone in attendance, with the exception of the immediate family remain standing for the duration as a mark of respect to the departed soul. Everyone including non-military personnel attending the funeral are expected to wear respectable mourning attire. As per the Flag Code of India, the Indian National Flag is draped on the caskets of the military martyrs with the saffron towards the head of the coffin. The Flag is folded and with the uniform of the martyr, is handed over to the next of kin after the ceremony. While the bugle plays the ‘last-post’ and the ‘rouse’. While the casket is being lowered into the grave. The non-military people and family of the departed soldier are expected not to salute, but remove hats and such other head-wear and place it over their heart during the salute by the military personnel. If they are not wearing hats, they should just fold their hands in ‘Namaste’ or cover their heart with their right hand. Having said so much about military funerals and the solemnity of the occasion, let me draw the reader’s attention to a common malaise observed during these ceremonies. The image above was taken at the Begumpet Airport on 15 February 2016 when the mortal remains of Martyr Sepoy Mushtaq Ahmad reached there and was received with full military honours. The body was later taken in a special ambulance to his native village in Kurnool district. The deplorable eyesore in the image is obvious to all. The military personnel are all standing in attention, while the pall bearers carry the casket on to the waiting ambulance. The journalists and their photographers were jostling for space to get the best shot for their media house. They paid scant regard for the martyr, the sentiments of the family members and for the sensitivity of the soldiers standing guard and performing the drill of the military funeral. In all the military funerals that I have conducted or attended while in service, these ‘jurnos’ were invariably a serious hindrance to the smooth conduct of the solemn event. So, now you well understand why one cannot blame the former Chief of the Army Staff and now a current central minister, for having chosen to collectively tag the ’jurnos’ with a rather apt appellation, to much furore. Amateur journalists often believe that their dharma of “the best coverage possible” takes precedence over everything else. They need to be educated about the need to care for peoples’ sentiments and the required respect for such solemn occasions. 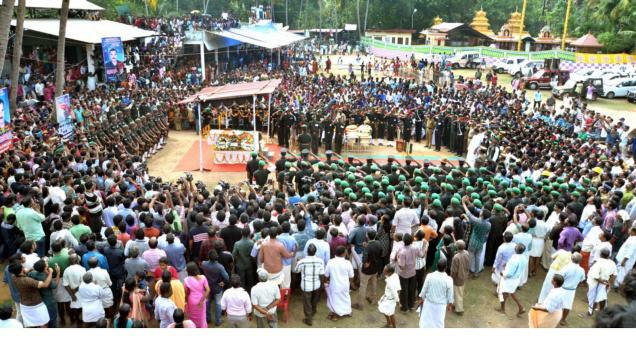 This is the image of the last rites of Martyr Lance Naik Sudheesh B at Kollam, Kerala. Here, the military funeral is being conducted in a very befitting manner. Obviously, the jurnos have kept away from the scene. The Army Officers responsible for the conduct of the funeral and the Kerala Police appear to have got their act together and kept them at a safe distance. There is an urgent need to formulate a policy guideline for the journalists, newspapers and media houses about their actions and conduct during military funerals. The Information Ministry must initiate procedures to coordinate the efforts of various agencies for such occasions. The national broadcaster- DoorDarshan – must take on the live streaming of the event as they are best equipped for the job and also have better commentators on their rolls, as compared to the vernacular media. A single feed can be provided to all the other channels, as being done during the Republic Day Parade, thereby ensuring better quality transmission across the globe. 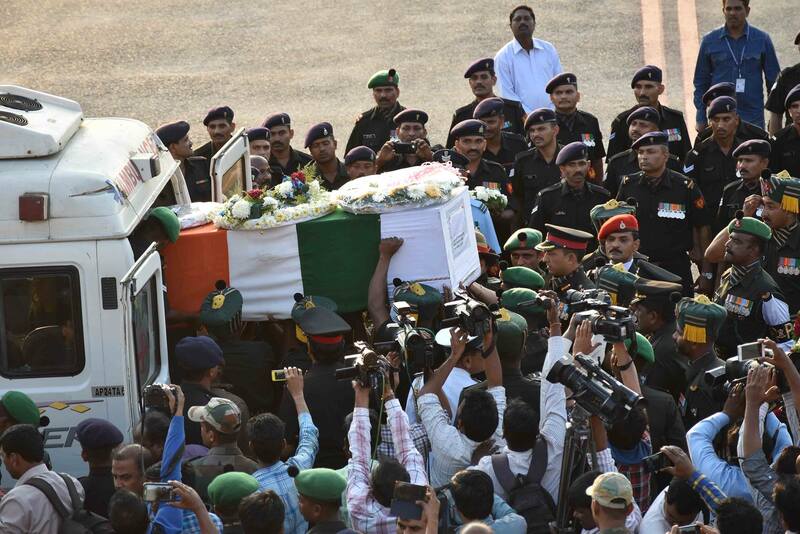 The still images for the print media can always be provided by the military unit conducting the funeral. They can appoint an official photographer who will in turn provide the images to the various media houses. One can only pray that in future there would be no such eyesores during similar solemn occasions. Well said Reji , Journos ! not only on solemn occasions but on many other occasions are an example how not to conduct oneself ! Many a time, a military funeral, degenerates to a photo session as the photographer wants the best coverage for his channel or news paper. The local politician and other local leaders see it as an opportunity to appear on TV or give interviews to the news paper as to how much they loved the fallen soldier. Such appearances on TV and mention in newspapers boosts their value in society and local politics.The actual loss is for the immediate family members as no promise of job or money by the Govt can fill the void left by the bread winner of the family. A policy on Military funerals can be promulgated by the defense ministry so that the media, local leaders and general public are aware and behave appropriately on these solemn affairs. Very timely Reji. Agree the public and more importantly the media need to be taught the proper etiquettes, and until this is done, the defence and police staff in attendance create a safe cordon around the family and the defence detachment. I came across this interesting post on Facebook today. Don’t come to my funeral to show how much you cared about me. Show how much you care about me – Now. While I am alive. A code of behavior is a must for media personnel and the managements should ensure it. Also, police could handle the smartphoneography. Good observation. The press is most horribly attired for any solemn occasion too as if they care a damn.